The framework for teaching is a research-based set of components of instruction that are grounded in a constructivist view of learning and teaching. The framework may be used for many purposes, but its full value is realized as the foundation for professional conversations among practitioners as they seek to enhance their skill in the complex task of teaching. The framework may be used as the foundation of a school’s or district’s recruitment and hiring, mentoring, coaching, professional development, and teacher evaluation processes, thus linking all those activities together and helping teachers become more thoughtful practitioners. The actions teachers can take to improve student learning are clearly identified and fall under four domains of teaching responsibility: Planning and Preparation, the School Environment, Instruction, and Professional Responsibilities. Within the domains are 22 components and 76 descriptive elements that further refine our understanding of what teaching is all about. The framework defines four levels of performance—Unsatisfactory, Basic, Proficient, and Distinguished—for each element, providing a valuable tool that all teachers can use. This second edition has been revised and updated and also includes frameworks for school specialists, such as school nurses, counselors, library and media specialists, and instructional coaches. Comprehensive, clear, and applicable to teaching across the K–12 spectrum, the framework for teaching described in this book is based on the PRAXIS III: Classroom Performance Assessment criteria developed by Educational Testing Service and is compatible with INTASC standards. 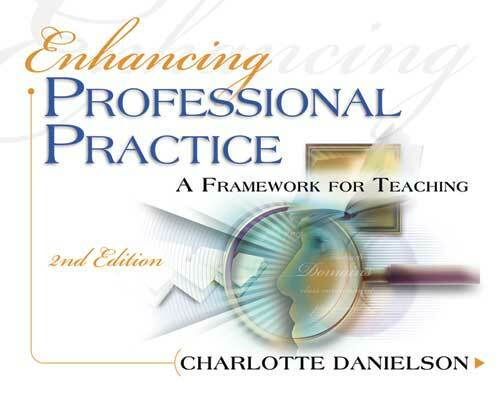 The Enhancing Professional Practice Video series brings to life the components of successful teaching practice and classroom observation practices and features author Charlotte Danielson. CHARLOTTE DANIELSON is an educational consultant based in Princeton, N.J. She has taught at all levels, from kindergarten through college, and has worked as an administrator, a curriculum director, and a staff developer in school districts in several regions of the United States.